Preheat oven to 350. Brush the eggplant and mushrooms with olive oil. Sprinkle with salt and pepper. Place on a parchment-lined baking sheet and bake 10-20 minutes or until softened and lightly browned. Set aside. In a saucepan, bring the stock to a simmer. Heat oil and butter in a large saucepan. Saute the onion, chile pepper and garlic until the onion is softened. Add the rice and spices and sauté for 2-3 minutes, stirring continually. Add the broth a 1/2 cup at a time, stirring continuously, and waiting until the liquid is absorbed before each addition. When the risotto is creamy and the rice is al dente remove from heat and stir in the Parmesan, green onions and eggplant. Scoop on to portobello mushroom caps. Garnish with shaved Parmesan if desired. I'm still working my way through the spoils of my trip to the chile roast and the Mushroom Festival so here is another recipe teaming the two together. 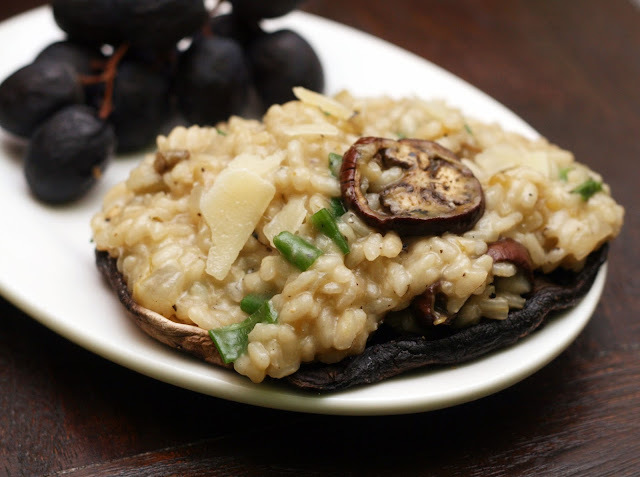 I had originally thought of putting the mushrooms in the risotto but I'm not always happy with how portobello risotto turns out (too tough, too full of chunks) so I thought I'd make eggplant risotto (I also had some lovely eggplants to use up) and "stuff" the mushrooms instead. It ended up being not only really tasty but filling! We normally eat risotto as a one pot, one course meal but with the mushrooms added it was like we were eating a pile of risotto and a whole steak. Roasting eggplant leaves it with a silky texture. Perfect for those who are on the fence about eggplants. It isn't bitter or spongy at all. Just warm and toasty tasting. The perfect foil for creamy risotto and hot pepper.